pick up dropped loop and pull through. Round 4 - Work 1ch, (1dc, 1tr, 2dtr, 1tr, 1dc) into each 3ch space to end, ss to first dc. Fasten off. Finishing - Weave in all loose ends and trim. 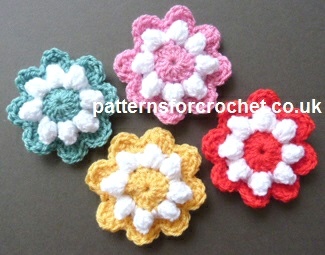 Hope you enjoy this free pattern for popcorn flower motif.